Borough of Poole: Pure Town Planning are celebrating a successful planning permission for a 9 unit residential development on Martello Road South, Poole. 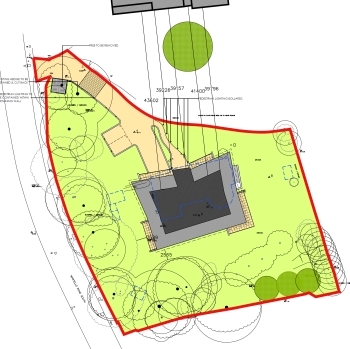 The proposal includes the demolition of the existing bungalow and erection of a three storey development on this spacious plot, which is heavily screened from the road by extensive trees and landscaping. Given the more intensive development surrounding the site, as well a previously approved scheme currently under construction directly opposite, the principle of further flatted development in Martello Road South was deemed acceptable by the Borough of Poole. Due to the context of the site and scale and proximity to neighbouring properties, a key design issue was to safeguard the privacy and amenity of both the existing and proposed occupants, whilst also preventing against any harmful impact in terms of the character and appearance of Martello Road South. From the outset of the application, in-depth consultations between Pure Town Planning, the architects Anders Roberts Cheer and the respective Officers have played a critical role in ensuring that the resulting three-storey building was sensitively designed. This collaboration ensured against any potential harm to neighbouring properties, whilst also allowing a suitable relationship to the existing trees on site which ensures their positive contribution on site will remain intact. Despite securing support from the respective Planning, Transportation and Arboricultural Officers, the application was brought before Planning Committee at the request of a Ward Councillor. Following our deputation at Planning Committee, Members subsequently voted in favour of the application, recognising the clear merits of the scheme which delivers 9 high-quality dwellings in this sustainable location. Here at Pure Town Planning, we like nothing more than securing our clients’ planning approvals. If you are working on a residential development and are looking for a firm who will work tirelessly to steer your development through the planning process, then why not give us a call or send us an email to info@puretownplanning.co.uk.